At Bright's Grove Family Pharmacy, you'll find caring professionals who will take the time to answer your questions, and to make certain that your prescriptions are prepared exactly as required. Pharmacist owners, Kelly and Paul Haggerty have been practicing pharmacy in the Bright's Grove / Sarnia area for over a decade. Focussed on providing personal, expert and knowledgeable service; Kelly, Paul and the staff at Bright's Grove Family Pharmacy are committed to superior patient care. In addition to preparing your prescriptions, Bright's Grove Family Pharmacy offers a wide range of professional services such as: women's health consults, pre-travel consulting, immunizations, injection services, INR testing and warfarin dose management, Medication review, compliance packaging, diabetes support, blood pressure monitoring, as well as flavoring of children's medications. Improving the health and well-being of people in the community is what Bright's Grove Family Pharmacy is all about. We accept all drug insurance plans. We are happy to deliver your medication right to your door. Switching from your current pharmacy to Remedy's Rx is much simpler than you may think. Simply contact us at 519-869-6900 and we will take care of the rest. We have the knowledge and ability to accurately transfer your prescription refills and medical history from any pharmacy. 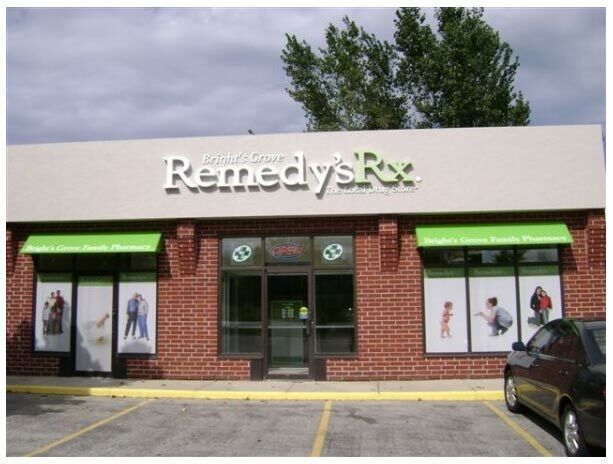 You too can experience the personal touch offered at Remedy's Rx – Bright's Grove Family Pharmacy. Our hope is to accommodate each of our client's needs and make them feel as comfortable as possible. To give our clients the privacy they desire, we provide all counselling in Private. Stop in today and experience pharmacy as it was meant to be.